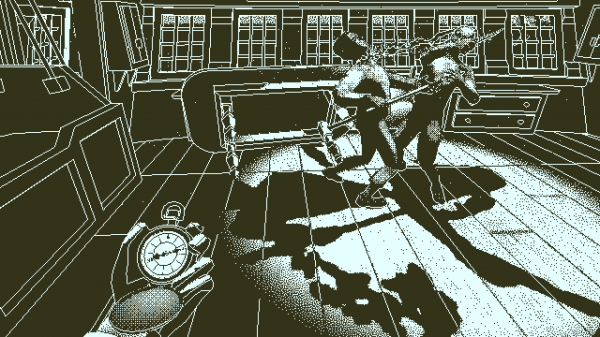 We’ve already established that Return of the Obra Dinn is one of the best detective games ever made, but it’s all the more impressive because it eschews nearly every element of a typical adventure game in doing so. Inventory puzzles? Nope. Environmental puzzles? Nada. Character interaction? With whom? They’re all dead! But who needs the standard genre trappings when you’ve got a ship full of horrific death and pixelized gore? 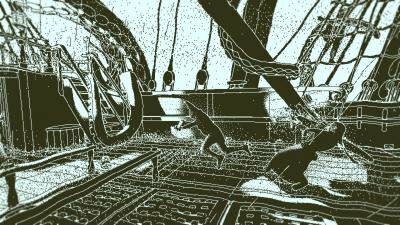 With its single-minded focus on identifying the dead crew of the Obra Dinn (and the methods by which they met their ends), this is a uniquely compelling experience that takes place primarily between the player’s ears in piecing together the game’s one giant logic puzzle. Not content merely to defy expectations about gameplay, however, indie deloper Lucas Pope has done a marvelous job bringing the ship to life (and death) in a stunning lo-fi, monochromatic style that recalls ‘80s MacVenture games like Déjà vu and Shadowgate, only thrust into the 3D era. Yet that deceptively simple visual approach belies a wealth of detail. Each frozen tableau of a character’s moment of death is deliciously complex, morbid, and often hilarious. This is a game that requires you to pay close attention to everything from the decorations on a sailor’s hammock, to the tattoos on their arms, to minor differences in accent and hairstyle. The package is topped off with a tragi-comically jaunty soundtrack, great voice acting, and atmospheric sound design. And the feeling of checking off another batch of names on your list of doom? Second to none. Return of the Obra Dinn is simply one of the most unorthodox but rewarding games of the year, and for that it’s the runaway Aggie winner for Best Non-Traditional Adventure. Mr. Plum with the candlestick in the library! Wait, no, that’s Clue. But when you think about it, Return of the Obra Dinn is a lot like Hasbro’s enduring board game – only instead of cards and dice, you have to really use your brain to piece together victim, cause of death, and murderer (if any). Sixty victims, that is – sixty!! There are no conventional puzzles to solve per se, because the entire mystery is one huge interwoven logic conundrum to crack, and it’ll take diligence and careful observation (and fess up – a little bit of guesswork as well) to succeed. It may look like a 1-bit game straight out of the 1980s, but it’s surprisingly effective in action, and it’s backed by a terrific soundscape throughout. Take a look at a screenshot and you might be tempted to dismiss it; take some time to play for a while and you’ll be hooked. Staff and readers are in accord: Lucas Pope has crafted a winner. Next up: Best Traditional Adventure... the envelope, please! I don’t often comment on these things for obvious reasons, but I just wanted to make one small correction. Violet Young was able to convincingly play a child because she is a child herself. She is 12 years old. D’oh! Well, that’s quite the achievement in its own right! But I’ll correct. I don’t know WHAT possessed me when I wrote that. It is so inconvinient without the summary. I want to see all winers for all categories with all nomenees in one page. It is annoying to go to different pages so often just to see the whole picture. I mean this awards can be a reason to play such games. I want to see a list of them not a sheet. We’re working on a sub-category on the site in which you can find an easy overview of Aggie Award winners, per category, per year. Bravo, Unavowed made me come back to this genre after years of pretty much only MOBA’ing. What a f***** good game. We just felt it was ultimately more of an interactive story game than an adventure game proper. Certainly close enough to cover here at AG, but we try to reserve the Aggies for games that meet our full genre criteria.